There’s an old saying of “don’t judge a book by its cover”, which most definitely applies to Who Are You: School 2015. Upon hearing its title and cast alone, I deemed it as just another teen Korean drama with shallow love stories and mediocre acting at best. But boy was I wrong. Who Are You: School 2015 proves that it deserves its popularity with an exceptional blend of gripping mystery and adorable high school romance. Not to mention the phenomenal acting performances from lead actress Kim So Hyun, who plays twin characters Lee Eun Bi and Go Eun Byul, and rookie actress Jo Soo Hyang, who plays main antagonist Kang So Young. I’m thoroughly impressed with how the young actresses convincingly channel their character’s divergent personas, making them that much more unforgettable. Who Are You: School 2015 builds suspense, tension, and curiosity with impeccable timing. Yet for me, the biggest surprise and delight of the drama is its ability in building suspense, tension, and curiosity with impeccable timing — at least through the first three-quarters of the series. It seems to know exactly when to present an eerie scene with ominous music, when to drop a dose of mystery when I least expect it, and when to soften the mood with a serving of sugar-sweet teenage romance. The drama is so engaging that hour-long episodes have never felt shorter. However, like most Korean dramas, once the secrets are revealed and the main conflicts are resolved, Who Are You: School 2015 had a much harder time keeping up the same level of impact towards the end. The awesome plot pretty much dwindles down to just your typical seesaw of loveline competition, except with much less intensity and emotional depth since it’s a teenage drama. But ultimately, the sluggish ending does not take away too much of my esteem for the show — simply because I’ve already been invested in its storyline and grown to love its characters. Who Are You: School 2015 quickly grabs my attention by delving into thrilling enigmas surrounding the twin sisters shortly after introducing its main cast. 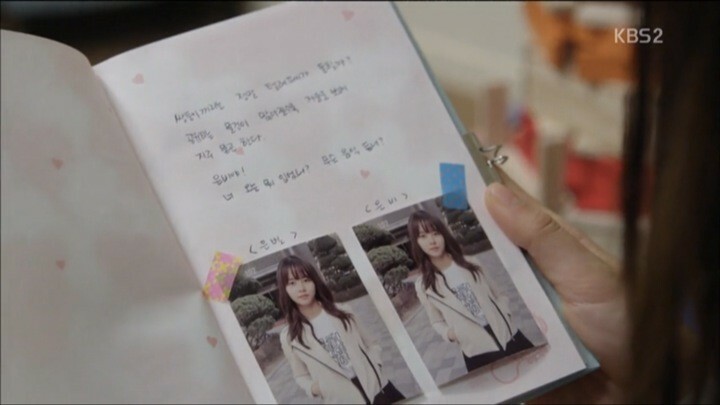 We begin by meeting Lee Eun Bi (Kim So Hyun), who grew up at an orphanage. She is considerate and compassionate, but too meek to stand up for herself while constantly getting bullied at school by her nemesis Kang So Young (Jo Soo Hyang). Eun Bi’s twin sister Go Eun Byul (Kim So Hyun) lives a complete separate life with her foster mom. Eun Byul is the polar opposite of Eun Bi in personality — confident and sassy. She’s quite popular at school with many close friends including long-time childhood BFF and competitive swimmer Han Yi An (Nam Joo Hyuk). The drama truly wastes no time in kicking off the mysteries. 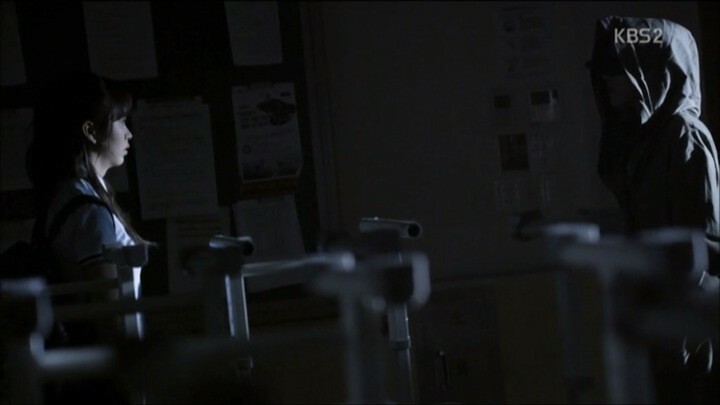 First, Eun Byul seems to be haunted by a stalker for an incident from the past. She is tormented by a cryptic text message sent in the name of her elementary school friend Jung Soo In. What happened before and who’s hawking over her? Next, Eun Bi attempts suicide after So Young gets her expelled from school while Eun Byul mysteriously disappears at the same time. Will they survive and live on? Finally, one of the sisters ends up waking up at the hospital with no memory of who she is. Everyone assumes it’s Eun Byul, but is she really? At this point, I’m completely mesmerized with the drama and anxiously waiting for all of my questions to be answered. One other highlight of the drama worth mentioning is that it does a particularly good job of utilizing side stories of sub-characters to uncover more of the main characters’ personality depth. This way, the secondary characters serve a purpose and don’t just appear like random afterthoughts. As an example, when the memory-less Eun Byul gets suspected for terrorizing fellow classmate Seo Young Eun for money, she becomes unsure of her own character. But through the reassurance of her friends, Eun Byul as well as the viewers discover what kind of person she truly is. Luckily for me, at least one of my curiosities is satisfied rather quickly. Eun Byul regains her memories and realizes that she’s actually a different person — Lee Eun Bi. With this unexpected discovery, Who Are You: School 2015 officially enters a new era of Eun Bi starting afresh using her sister’s identity. This leads to several crucial plot lines developing simultaneously, making these episodes the most exciting and gratifying ones yet. The mysteries surrounding Eun Byul continue. Eun Bi finds out that Eun Byul had been aware of her existence all along and feels guilty for getting adopted over her. 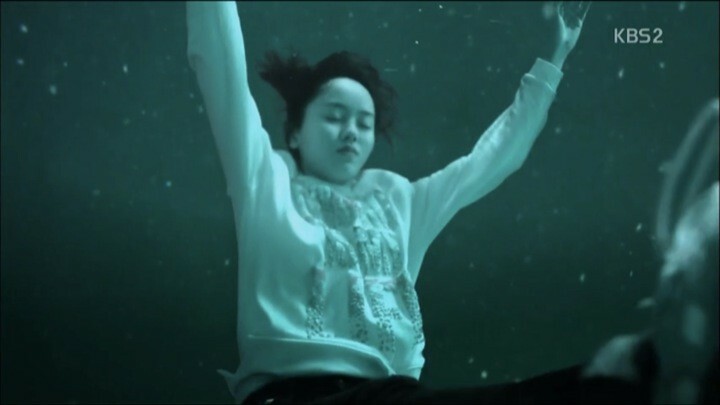 It’s also revealed that Eun Byul is the one who saved Eun Bi and likely drowned in her place, hence her disappearance. But the more Eun Bi learns about her sister, the more she realizes that Eun Byul has a hidden secret that’s been haunting her — something having to do with the continued strange text messages from Soo In. Determined to uncover the truth, Eun Bi leads us into a thrilling pursuit for answers. But Eun Bi also has her own headache to deal with. Completely coming out of left field, Eun Bi’s old rival Kang So Young shockingly transfers to her new school. What a startling catalyst to add to the already intricate storyline! As So Young fervently looks for ways to prove that Eun Byul is actually Eun Bi, my heart pounds with fear worrying whether Eun Bi can hold her own in this dangerous mind game. While battling it out with So Young, Eun Bi starts to build a closer friendship with her new pal Gong Tae Kwang (Yook Sung Jae) and develop feelings for her “old friend” Han Yi An. Tae Kwang takes a particular interest in Eun Bi once he notices that the impudent Go Eun Byul has turned into a warm-hearted, approachable person. Through circumstances, they end up sharing their secrets with each other and spend more time together. Of course, Yi An is not happy to find his childhood crush Eun Byul getting closer to Tae Kwang. Jealousy is the perfect fuel to heat up the boys’ rivalry over Eun Bi as I sit back and enjoy the silly yet amusing teenage boy tug-of-war. The three prongs of Who Are You: School 2015‘s plot — Eun Byul’s secret, So Young’s vengeance, and the love-triangle rivalry — continue to sprout with ever-increasing intensity. Coupled with a huge unforeseen cliffhanger at the end of episode 10, the drama maintains its captivating draw for me. Eun Bi’s war with So Young is escalating fast. Each time the girls have a confrontation, I feel an incredible adrenaline rush and a sense of pride when the once sheepish Eun Bi leaves So Young flabbergasted. Thank you Who Are You: School 2015 for giving me a heroine who’s not simply stuck in her stereotype, but actually grows stronger as the drama progresses. Meanwhile, Yi An becomes increasingly frustrated and confused that “Eun Byul” seems more and more unfamiliar to him, hidden behind a layer of mystique. After a tip-off from So Young, he finally acknowledges the noticeable differences between the sisters and acts awkwardly around Eun Bi. Feeling devastated in losing Yi An, Eun Bi leans on Tae Kwang for emotional support. Kim So Hyun accurately conveys the heartbroken sadness and hopelessness her character feels and makes every viewer feel sorry for Eun Bi. Last but not least, let’s not forget about the Soo In riddle gradually unfolding in the background. Not only are we presented with additional clues of Eun Byul’s involvement, but also hints of an even bigger conspiracy that involves more people than expected. A tingling feeling that we’re slowly approaching the truth keeps me more enthralled than ever. Typically, this is the lull period for Korean dramas, but Who Are You: School 2015 successfully sustains my interest by unveiling the secrecy behind the biggest mystery of the drama. It amazingly manages to preserve the suspense and thrill up to the moment of final revelation. Yet the ultimate truth proves to be quite anticlimactic and somewhat of a letdown compared to the masterful build-up to this point. Thankfully, the drama quickly transitions to another major twist that diverts my attention before I have a chance to mull over the disappointment. On the romance front, progress drastically slows down as Yi An mopes around in light of the fake Eun Byul news. He eventually recognizes Eun Bi for who she is, but not without excessive efforts in pushing her away and intentionally hurting her feelings first. Such unnecessary and upsetting immaturity! It wasn’t until So Young outright questions Yi An whether he likes Eun Byul or Eun Bi that leads him to seriously think about his feelings towards the sisters. With the Soo In puzzle solved, the last chapter is left with the two other remaining plot lines: the final showdown against So Young and the affirmation of the loveline. Unfortunately, the outcomes of both are equally predictable and cliche. What’s worse is that they’re being dragged out over three episodes, with many filler scenes interspersed to extend the drama. The one redeeming aspect I appreciate is that the drama does a good job of tying up all of the loose ends, leaving no unexplained events or motives. The weak ending aside, Who Are You: School 2015 still manages to leave a deep impression on me with its elaborate storyline and terrific acting. I may have had lower expectations for the drama initially, but I can now say with certainty that those expectations have been shattered through and through. I don’t get does it mean that her twin sister is really death?